Lovelovelove the rug. The colors are so pretty, and the quality is about as good as you can possibly get for $257. 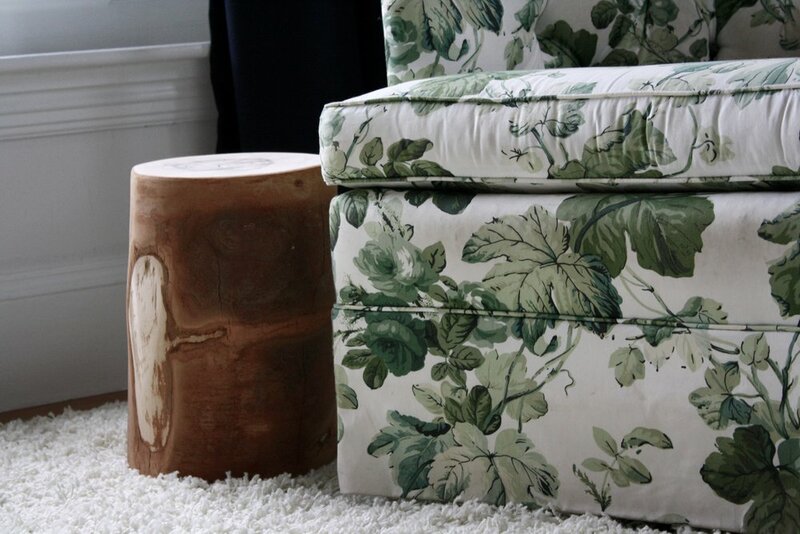 ALSO lovelovelove the green flower chair. In another room they would work together, but it just didn’t mesh in real life in the boys room. 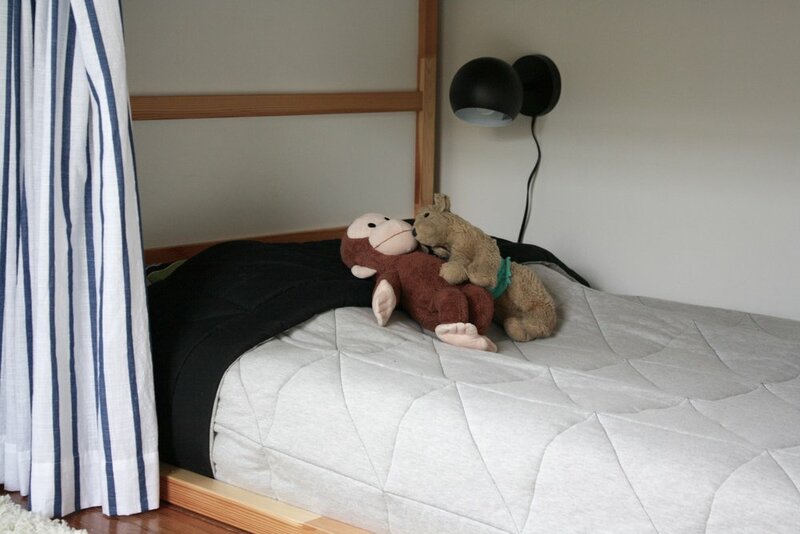 I want their room to feel simple, and the combo felt complicated. On paper it worked, so what happened? Designing a room is not necessarily a sleek and linear process. You can have the best, most complete, well thought out plan ready to go, and then something doesn’t work in real life. 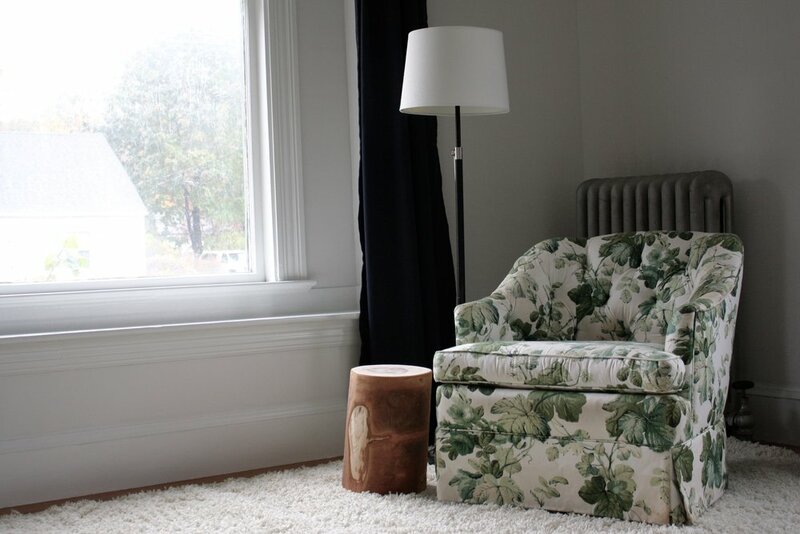 Case in point: fabulous chair + dreamy rug = decor competition that doesn’t mesh. Which leads to this point: STAY FLEXIBLE. Allow for plans to change. 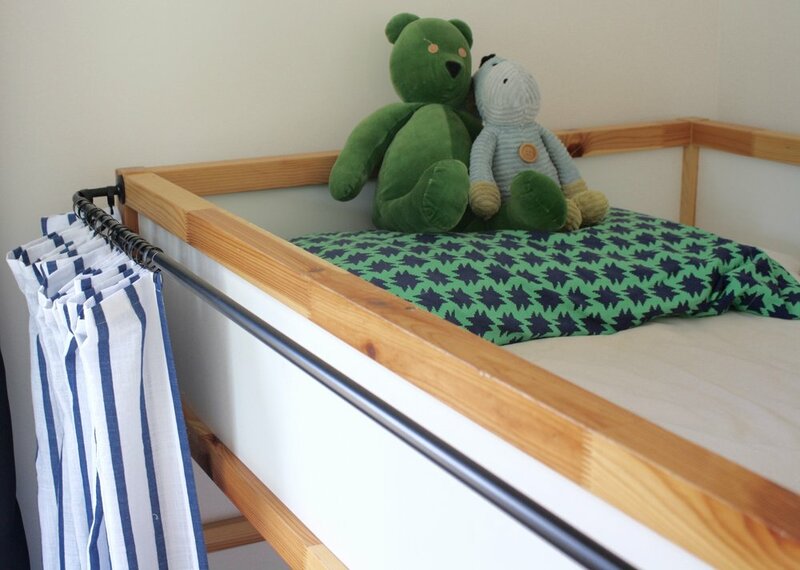 The main direction of the boys bedroom is the same, and most of the elements are just what I initially planned… but now we are on the third rug. And you know what they say about the third time being the charm? It’s true. Once I nailed down that it was the rug that had to change (not moving that chair!! ), I decided a giant neutral shag was the way to go. My younger son comes to hang out in my office just to lie on my shag rug. But have you ever shopped for a 9x12 rug? $$$!!! I was shopping on a site that had 45% off advertised, and kept trying to do the calculations, all the while wondering why they weren’t showing the sale price, as they usually did. Then I realized they WERE showing the sale price, and $500+ was about as good as it got. Buh-byeeee! Thanks to trusty old Amazon for a 9x12 shag with great reviews for $155! Remember, boys are kind of gross. I might have cleaned boogers off the wall before I repainted their room. So we’re not spending big bucks on their rug. Maybe when they are older. Though do boys ever get less gross? I feel like we’re just going to move from boogers to modeling clay and stinky socks. This bedroom has the unique challenges of no ceiling light and only 2 outlets. So I have to run the cord for the floor lamp 13 feet across the room and behind the bookcase to plug it in. The extra bonus of the larger rug (my poor little zebra that is no more was only 7’6” x 9’6”) is that I can run the extension cord UNDER the rug. Yes. I agree it would be better to install another outlet, but it’s not in the works right this second. The next best surprise was that the rug arrived a week early, tonight as we were sitting down to dinner! Due to it’s giant size, it was folded in half after being rolled, and then plastic wrapped into a giant green blob, so I’m going to let it flatten out a bit more before any pictures happen. 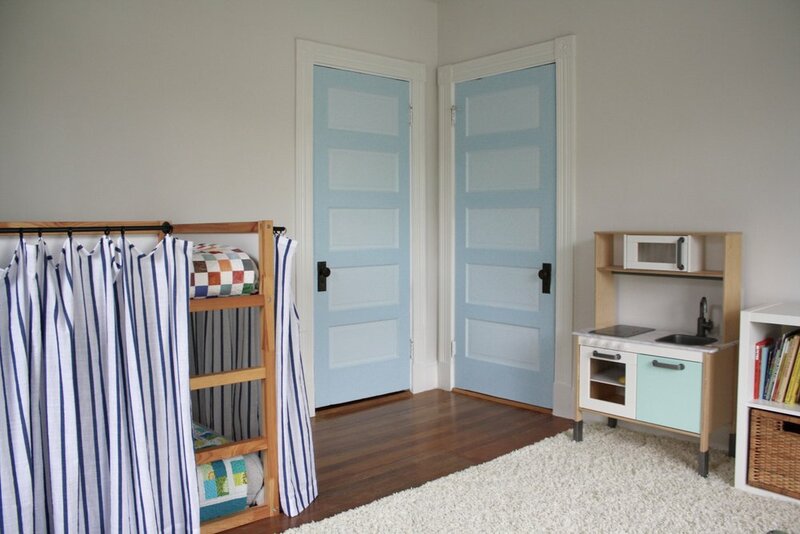 One of the biggest projects I tackled this week was painting the boys doors. The door into their room is in the same corner as their closet door, at 90 degrees from each other. Together they provide an irresistible opportunity to introduce a little more color into the room. I’ve been debating green vs. blue and bold vs. subtle for weeks, and finally decided yesterday morning it was time to bite the bullet. After pinning about 40 doors, I picked three green colors and painted samples on one of the doors. That clarified things immediately! Green was out of the running, and I would stick to a light blue… or two… Benjamin Moore’s Watercolor Blue (793) and Mystical Blue (792). One more area I made (some) progress in this week was lighting. I ordered small wall-mounted sconces from Urban Outfitters, and when they arrived it took about 20 minutes to get them both mounted by their beds. So simple! 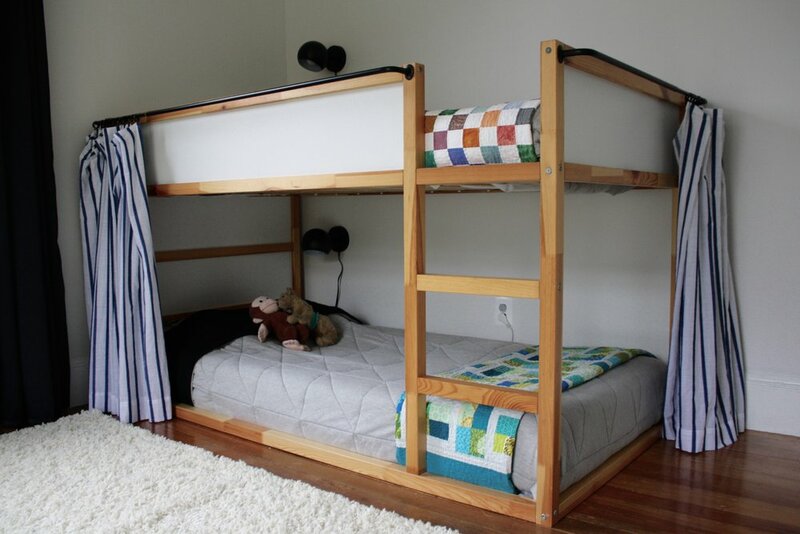 I wanted something low profile so the boys don’t bump into them at night, particularly on the lower bunk. You will notice, though, that the Emperor has no clothes. I still don’t have the right light bulbs almost a full week later. I also need to get a flat-head extension cord to plug in instead of having both cords sticking out of the outlet. I know. 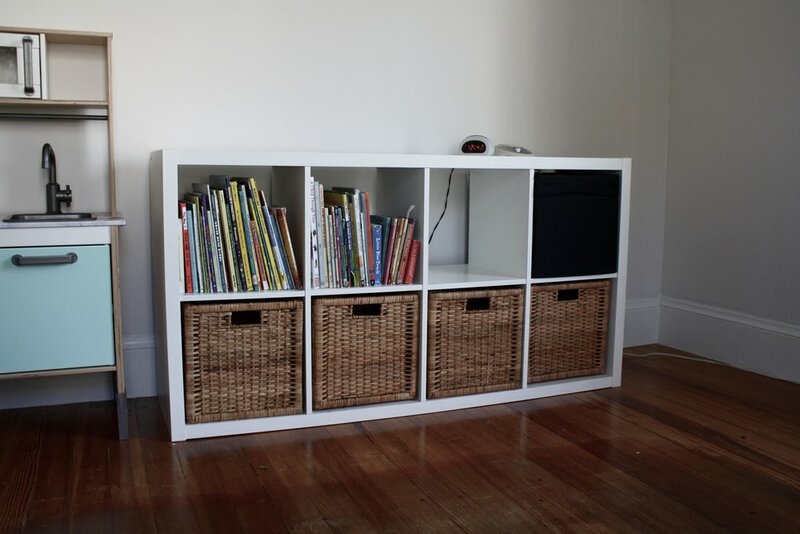 This looks mostly the same, except the books are slightly tidier and I swapped out the bins for baskets. I’ve done the black-wash treatment to the wood for the KALLAX unit, and thanks to my dad have also cut it down to size (I don’t have a table saw of my own… yet.). Next I need to sand/poly/sand/poly it, then attach the wood. So that will be another week or two, depending on weather and time management. 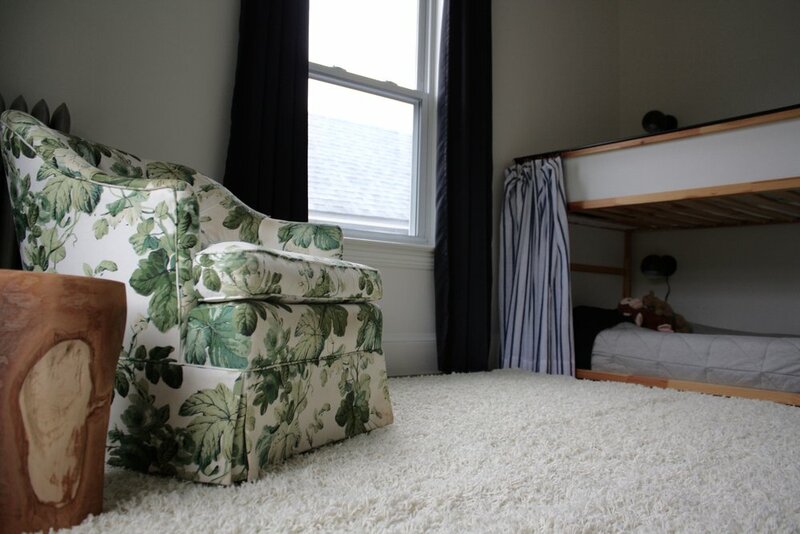 Plenty still to come, from art and textiles to dressing up their curtain panels, finding the perfect thrifted footstool / side table for next to the chair, sorting out bedding, and pulling together the ceiling treatment. Moving full speed ahead! Be sure to check out the 20 featured designers and all the guest participants on the One Room Challenge Blog, link below! There are some great projects happening, and I’ll be sharing about some of them coming up soon on Instagram. Be sure to follow me on the ‘gram to be in the know! 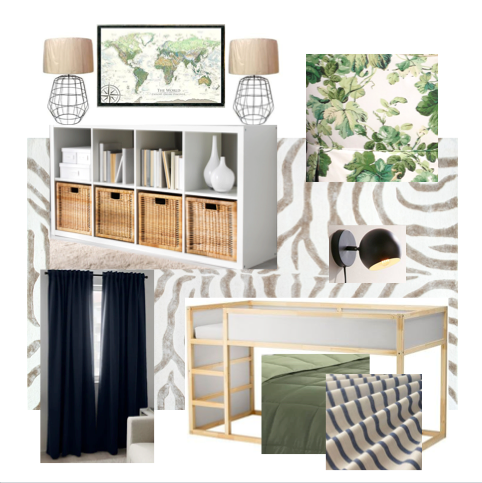 It’s only been a few days, and the moodboard for the boys room has already seen significant changes. 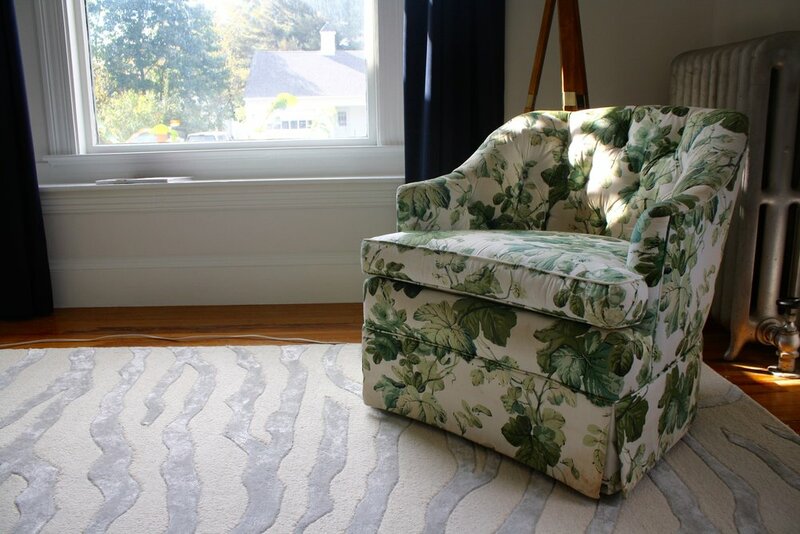 It started out with a geometric rug that I’d had my eye on for some time… but that rug didn’t really work with my craigslist chair find. 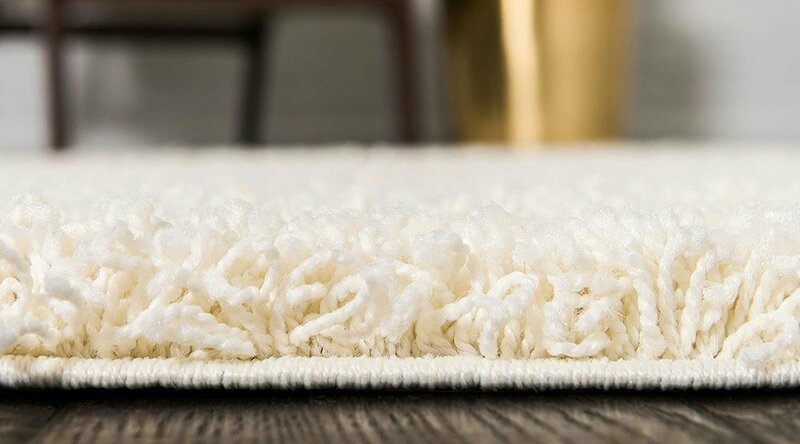 So I went back to the drawing board, and focused on light colored neutral rugs. I was almost sold on a plush cream shag, when I came across this zebra print from RugsUSA. It was an “aha” moment, but it’s so different from what I’d initially had in mind that I decided to run it by my two favorite decor buddies. They both agreed that it added the right touch, so I immediately pulled the trigger to take advantage of the 55% off Columbus Day sale. 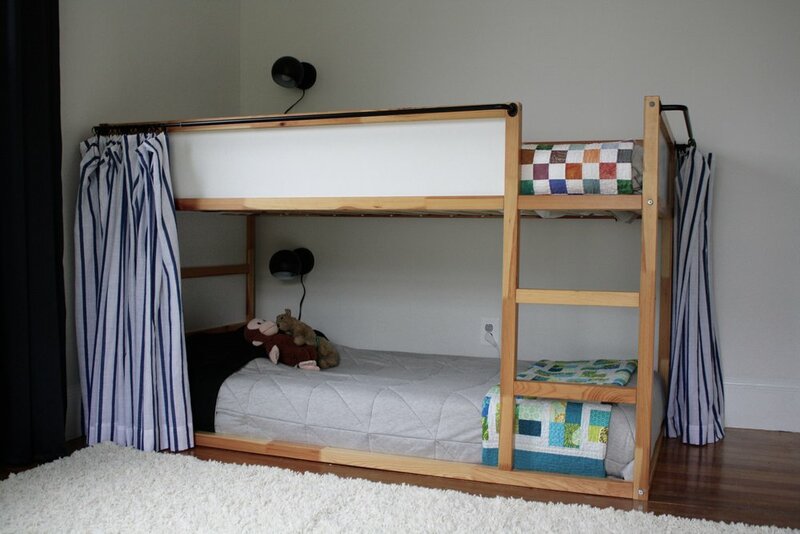 Usually I’d sleep on it, but I didn’t want it to get sold out and go on backorder past the One Room Challenge deadline! Yes, it is a very light colored rug. Yes, it’s going into a boys room. But we are a no shoes in the house family, and I’m going to Scotchguard the crap out of it. And then cross my fingers that we never have another Blueberry Vomit Situation again. The addition of the chair and change in rug have clarified the direction of the room, and I’m so excited to see it all move forward. Now that I’ve painted the trim, walls, and ceiling, I can get going on some of the fun stuff. 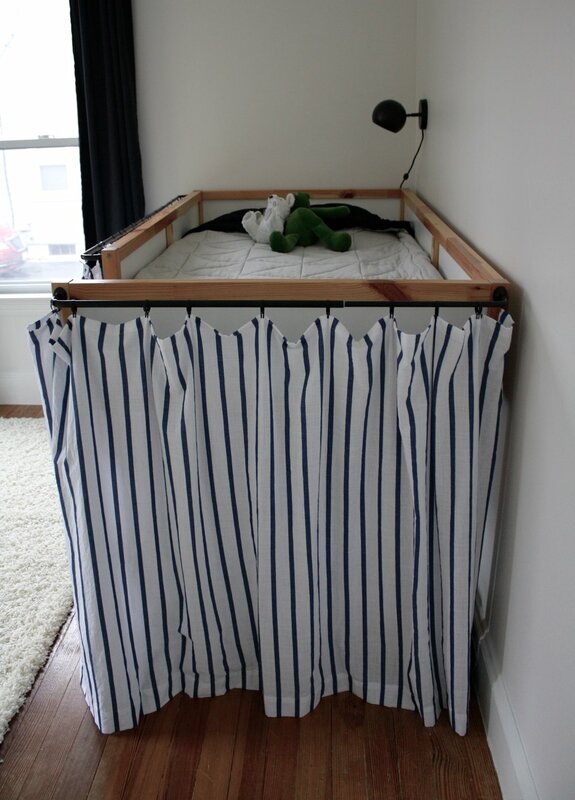 The boys already have the KURA loft bed from IKEA, and I’m going to be adding blue and white stripe curtains on the side and end. My three year old loves to have a cave-like bed, and currently has most of his dress up clothes tucked in various places. 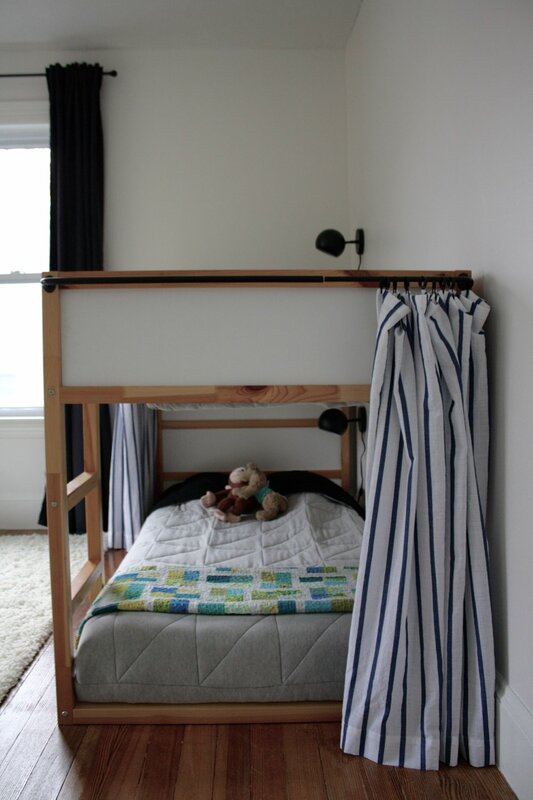 When you duck down and look in, you can see his Batman cape and policeman jacket hanging side by side from the slats that hold big bro’s mattress up. On the long side he has scarves tied on, and the latest addition today was a scarf that he fashioned into a hammock for his favorite stuffie. Customizing their KALLAX shelving unit. I have an image in my head of a wood wrap that waterfalls into legs that hold it up about 4 inches off the ground. And I’m sure that makes no sense to most people because as of right now it only exists in my head, but in my head it’s really cool. Grosgrain ribbon detailing on the existing blackout curtains in a grid pattern. 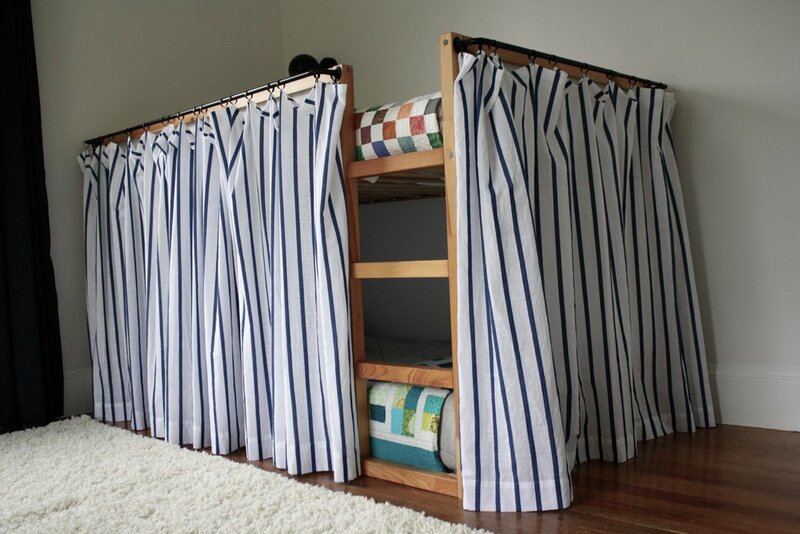 The curtains are staying because these boys NEED blackout curtains. Our lives are all miserable without them. As mentioned above, bed curtains. And tomorrow I’ll be taking advantage of the warmer weather to spray paint the cafe curtain clips to hold said curtains on the rod. Black rod + oil rubbed bronze clips = blech! I looked everywhere for black clips, but they don’t exist (Amazon, you let me down!) so spray paint it is. I MIGHT also spray paint a set of lamps that I have for their room, but am torn between finding something new (old) on craigslist and selling these, or spray painting them. We’ll see. Art. ART! Finally. I’m planning a giant map above their shelving unit. And have a couple other ideas percolating. I have an idea for a sort of miniature bunting that would hang at ceiling level and cris-cross from wall to wall. Kind of like string art, but on a larger scale. And with color. And again, impossible to show an example of before I just do it. This one’s going to either be really really cool, or really really awful. Totally depends on execution, I think. And with that, I’m off to get sewing!